God protects Daniel from the lions. KING DARIUS, THEnew ruler, chose one hundred and twenty princes to help him govern the people of his great kingdom. Over these princes he appointed three presidents, and because he found that Daniel was a very wise old man he made Daniel the first president. So Daniel was more highly honored than any of the princes or other presidents. A better feeling of jealousy began to stir in the hearts of these princes and presidents. They hated Daniel because the King had honored him so greatly. They decided to watch him carefully, and find fault with him at their first opportunity. But their careful watching only revealed to them the fact that Daniel was a very faithful man, with no faults that might displease the King. Their careful watching revealed another fact, too; and this one was that Daniel was deeply religious. Often they saw him kneel before his open window and pray to his God. He never seemed too busy to take time to pray. At last the men confessed among themselves that they could find no fault with Daniel. But they planned another way to rob him of his great honor. A cruel way, it was, but they were wicked men and they did not mind at all. Darius was surprised to see the great company of his princes assembled before him. He did not notice that Daniel was not among them. He did not guess that they were plotting against his faithful servant. So he permitted them to tell the purpose that had brought them to his palace, and they said, “King Darius, live forever. All the presidents of the kingdom, and the princes, the governors, the counselors, and the captains have planned to establish a royal law and to make it very binding. Now the truth was that all the presidents of the kingdom had not helped to plan that law, for Daniel had no part in it. But the King did not know. And because he was a heathen king, with a proud heart, he felt flattered to hear the law. So he readily consented to it, and he caused it to become published among all the people. Of course Daniel heard about the law. But three times every day Daniel knelt, just as he had done before, and prayed by his opened window with his face toward Jerusalem, the city where God’s house used to stand. And there these men found him on his knees thanking God. Now they were sure they should soon be rid of this good man whom they despised. So they came to tell the King how Daniel had dared to disobey the new law. They reminded the King that the laws he made could not be changed, and Daniel would have to be punished for his disobedience. Darius understood, when too late, why this law had been made. He knew the presidents and princes had not desired to honor him, but only to rid themselves of the one whom they hated. And Darius was sorry, very sorry, that he had listened to the flattering words of these wicked men. All day long he tried to think of some way in which to spare Daniel from such a cruel fate; all day long he worked hard, studying the laws of his country and hoping to find something that would release him from enforcing such a punishment upon his faithful servant. But finally the sun went down, and the presidents and princes came impatiently to the palace and told the King that his new law must be obeyed. 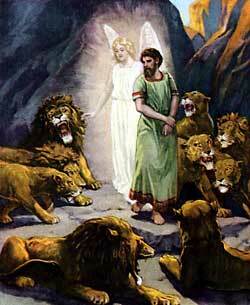 And Darius feared to try longer to save Daniel, so he told them to bring him out and cast him into the lions’ den. The King told Daniel how sorry he was to see this dreadful punishment brought upon him. Then he saw Daniel thrown into the den, making Daniel a prisoner inside among the savage beasts. Afterwards, according to the law of his country, he put his own seal upon the great stone, so that no one would dare to remove it without the King’s command. Then, with a heavy heart, he went back to his palace. All that night long Darius could not sleep. He was too troubled to enjoy any kind of entertainment, for he thought constantly about his faithful servant in that terrible den. He longed for the morning light, and with the first break of dawn he rose up from his bed and ran quickly to the lions’ den. Darius was very glad, and he called his servants to come and take Daniel up out of the den. Then he commanded that the wicked men be brought who had planned to get rid of Daniel, and he told his servants to cast them into the den of lions where Daniel had been all the long night. When they fell, screaming, into the deep pit, the lions rushed upon them and tore them in pieces, for they were not worthy to live. Darius wrote letters to the people of every nation, telling them about the wonderful way in which God had delivered Daniel from the lions. And he made a law that all the people in his great kingdom should fear the God of the Jews.